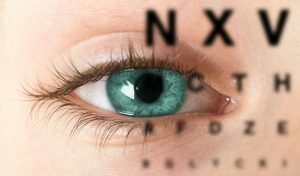 Should yearly vision exams be in your diabetes routine? Carbohydrate counting, staying active, and checking your blood glucose levels may remind you of the typical diabetes care routine. However, other aspects of diabetes care must not be forgotten. Foot care, dental care, and high cholesterol are just a few other check-ups that are important to diabetes care. Those with diabetes are at high risk for foot ulcers due to decreased blood flow to the feet caused by diabetes-related nerve damage. Also, those with diabetes are at greater risk than those without diabetes for gum infections. Furthermore, those with diabetes have been shown to have greater blood vessel damage when they have high cholesterol than those without diabetes. Another important part of diabetes care is regular vision check-ups. This is because those with diabetes are at higher risk for conditions such as glaucoma, cataracts, and retinopathy than those without diabetes. Diabetes-related nerve damage that occurs as a result of uncontrolled blood glucose levels can greatly impact vision health. According to the National Eye Institute, all forms of diabetic eye disease can lead to severe vision loss and blindness. However, it is diabetic retinopathy that is the most common cause of vision loss among those with diabetes. The retina is a light-sensitive tissue that lines the back of the eye. The retina detects light and sends a signals through the optic nerve to the brain. Next, the brain converts this electrical signal to an image. Uncontrolled diabetes damages vessels of the optic nerve, therefore worsening vision. When someone has diabetic retinopathy, vessels in the retina swell and leak fluid into the retina. In turn, this fluid distorts vision. Furthermore, in advanced stages of the disease, scarring of the retina can occur, which can eventually pull the retina away from the underlying tissue, which in turn could lead to blindness. In addition to getting regular exams, everyone, no matter their diabetes status should take steps to maintain vision health. Consuming vitamin A-rich foods such as brightly-colored veggies like carrots, peppers, and leafy greens is one way to support retinal health. Furthermore, leafy greens, as well as pistachios, contain the eye-healthy antioxidants lutein and zeaxanthin that can lower your risk of eye disease. Finally, taking supplements with these eye-healthy nutrients can help you maintain your vision health. Vita Sciences‘ Ocutain contains both lutein as well as beta-carotene, which support eye health. Also, be sure to visit Vita Sciences for other supplements such as Glucarex, which can support healthy blood glucose levels. Also, be sure to visit the American Optometric Association website for further research and information on ways you can maintain vision health. Dreher, M.L. (April 2012) “Pistachio nuts: composition and potential health benefits.” Nutrition Reviews, 70(4):234-40.